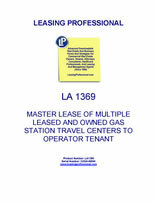 This form is designed for a transaction in which the landlord leases multiple travel center sites to a filling station operator/tenant pursuant to a master lease agreement. The locations are include both travel centers owned outright by the landlord and as well as properties leased by the landlord from other third party owners. This comprehensive lease sets a minimum aggregate rent for all properties, and obligates the tenant to pay all real estate taxes, utilities, and insurance costs for the travel center locations during the term of the lease. The tenant must also pay percentage rent on sales during the term in excess of base year sales. THIS LEASE AGREEMENT is entered into as of __________, 20__, by and among FILLING STATION PROPERTIES, a _____________ limited liability company ("Landlord"), and FILLING STATION OPERATOR, L.P. , a _____________ limited partnership ("Tenant"). For all purposes of this Agreement, except as otherwise expressly provided or unless the context otherwise requires, (a) the terms defined in this Article shall have the meanings assigned to them in this Article and include the plural as well as the singular, (b) all accounting terms not otherwise defined herein shall have the meanings assigned to them in accordance with GAAP, (c) all references in this Agreement to designated "Articles", "Sections" and other subdivisions are to the designated Articles, Sections and other subdivisions of this Agreement, and (d) the words "herein", "hereof", "hereunder" and other words of similar import refer to this Agreement as a whole and not to any particular Article, Section or other subdivision. 1.1 "Additional Charges" shall have the meaning given such term in Section 3.1.3. 1.2 "Additional Rent" shall have the meaning given such term in Section 3.1.2(a). 1.3 "Affiliated Person" shall mean, with respect to any Person, (a) in the case of any such Person which is a partnership, any partner in such partnership, (b) in the case of any such Person which is a limited liability company, any member of such company, (c) any other Person which is a Parent, a Subsidiary, or a Subsidiary of a Parent with respect to such Person or to one or more of the Persons referred to in the preceding clauses (a) and (b), (d) any other Person who is an officer, director, trustee or employee of, or partner in or member of, such Person or any Person referred to in the preceding clauses (a), (b) and (c), and (e) any other Person who is a member of the Immediate Family of such Person or of any Person referred to in the preceding clauses (a) through (d). 1.4 "Agreement" shall mean this Lease Agreement, including all exhibits attached hereto, as it and they may be amended from time to time as herein provided. 1.5 "Applicable Laws" shall mean all applicable laws, statutes, regulations, rules, ordinances, codes, licenses, permits, notices and orders, from time to time in existence, of all courts of competent jurisdiction and Government Agencies, and all applicable judicial and administrative and regulatory decrees, judgments and orders, including common law rulings and determinations, relating to injury to, conservation of, or the protection of, real or personal property or human health or the Environment, including, without limitation, all valid and lawful requirements of courts and other Government Agencies pertaining to reporting, licensing, permitting, investigation, remediation and removal of underground improvements (including, without limitation, treatment or storage tanks, or water, natural gas or oil wells), or emissions, discharges, releases or threatened releases of Hazardous Substances, chemical substances, pesticides, petroleum or petroleum products, pollutants, contaminants or hazardous or toxic substances, materials or wastes whether solid, liquid or gaseous in nature, into the Environment, or relating to the manufacture, processing, distribution, use, treatment, storage, disposal, transport or handling of Hazardous Substances, underground improvements (including, without limitation, treatment or storage tanks, or water, gas or oil wells), or pollutants, contaminants or hazardous or toxic substances, materials or wastes, whether solid, liquid or gaseous in nature. 1.6 "Award" shall mean all compensation, sums or other value awarded, paid or received by virtue of a total or partial Condemnation of any Property (after deduction of all reasonable legal fees and other reasonable costs and expenses, including, without limitation, expert witness fees, incurred by Landlord, in connection with obtaining any such award). 1.7 "Base Fuel Gross Revenues" shall mean, with respect to any Property, the amount of Gross Fuel Revenues for such Property for the Base Year. 1.8 "Base Non-Fuel Gross Revenues" shall mean, with respect to any Property, the amount of Gross Non-Fuel Revenues for such Property for the Base Year. 1.9 "Base Year" shall mean the 20__ calendar year. 1.10 "Business Day" shall mean any day other than Saturday, Sunday, or any other day on which banking institutions in state of _____________ are authorized by law or executive action to close. 1.11 "Capital Addition" shall mean, with respect to any Property, any renovation, repair or improvement to such Property, the cost of which constitutes a Capital Expenditure. 1.12 "Capital Expenditure" shall mean any expenditure treated as capital in nature in accordance with GAAP. 1.13 "Capital Replacements Budget" shall have the meaning given such term in Section 5.1.1(b). 1.14 "Change in Control" shall mean (a) the acquisition by any Person, or two or more Persons acting in concert, of beneficial ownership (within the meaning of Rule 13d-3 of the SEC) of 9.8% or more, or rights, options or warrants to acquire 9.8% or more, of the outstanding shares of voting stock or other voting interests of Tenant or any Guarantor, as the case may be, or the power to direct the management and policies of Tenant or any Guarantor, directly or indirectly, (b) the merger or consolidation of Tenant or any Guarantor with or into any other Person (other than the merger or consolidation of any Person into Tenant or any Guarantor that does not result in a Change in Control of Tenant or such Guarantor under clauses (a), (c) or (d) of this definition), (c) any one or more sales or conveyances to any Person of all or any material portion of its assets (including capital stock or other equity interests) or business of Tenant or any Guarantor, as the case may be, or (d) the cessation, for any reason, of the individuals who at the beginning of any twenty-four (24) consecutive month period (commencing on the Commencement Date) constituted the board of directors of Tenant or any Guarantor (together with any new directors whose election by such board or whose nomination for election by the shareholders of Tenant or such Guarantor, as the case may be, was approved by a vote of a majority of the directors then still in office who were either directors at the beginning of any such period or whose election or nomination for election was previously so approved) to constitute a majority of the board of directors of Tenant or any Guarantor then in office. 1.15 "Claim" shall have the meaning given such term in Article 8. 1.16 "Code" shall mean the Internal Revenue Code of 1986 and, to the extent applicable, the Treasury Regulations promulgated thereunder, each as from time to time amended. 1.17 "Commencement Date" shall mean the date hereof. 1.18 "Condemnation" shall mean, with respect to any Property, or any portion thereof, (a) the exercise of any governmental power with respect to such Property, whether by legal proceedings or otherwise, by a Condemnor of its power of condemnation, (b) a voluntary sale or transfer of such Property by Landlord to any Condemnor, either under threat of condemnation or while legal proceedings for condemnation are pending, or (c) a taking or voluntary conveyance of such Property, or any interest therein, or right accruing thereto or use thereof, as the result or in settlement of any condemnation or other eminent domain proceeding affecting such Property, whether or not the same shall have actually been commenced. 1.19 "Condemnor" shall mean any public or quasi-public Person, having the power of Condemnation. (f) any and all leases of space in the Leased Improvements. 2.2 Condition of Leased Property. Tenant acknowledges receipt and delivery of possession of the Leased Property and Tenant accepts the Leased Property in its "as is" condition, subject to the rights of parties in possession, the existing state of title, including all covenants, conditions, restrictions, reservations, mineral leases, easements and other matters of record or that are visible or apparent on the Leased Property, all applicable Legal Requirements, the lien of any financing instruments, mortgages and deeds of trust existing prior to the Commencement Date or permitted by the terms of this Agreement, and such other matters which would be disclosed by an inspection of the Leased Property and the record title thereto or by an accurate survey thereof. TENANT REPRESENTS THAT IT HAS INSPECTED THE LEASED PROPERTY AND ALL OF THE FOREGOING AND HAS FOUND THE CONDITION THEREOF SATISFACTORY AND IS NOT RELYING ON ANY REPRESENTATION OR WARRANTY OF LANDLORD OR LANDLORD’S AGENTS OR EMPLOYEES WITH RESPECT THERETO AND TENANT WAIVES ANY CLAIM OR ACTION AGAINST LANDLORD IN RESPECT OF THE CONDITION OF THE LEASED PROPERTY. LANDLORD MAKES NO WARRANTY OR REPRESENTATION, EXPRESS OR IMPLIED, IN RESPECT OF THE LEASED PROPERTY OR ANY PART THEREOF, EITHER AS TO ITS FITNESS FOR USE, DESIGN OR CONDITION FOR ANY PARTICULAR USE OR PURPOSE OR OTHERWISE, AS TO THE QUALITY OF THE MATERIAL OR WORKMANSHIP THEREIN, LATENT OR PATENT, IT BEING AGREED THAT ALL SUCH RISKS ARE TO BE BORNE BY TENANT. To the maximum extent permitted by law, however, Landlord hereby assigns to Tenant all of Landlord’s rights to proceed against any predecessor in interest or insurer for breaches of warranties or representations or for latent defects in the Leased Property. Landlord shall fully cooperate with Tenant in the prosecution of any such claims, in Landlord’s or Tenant’s name, all at Tenant’s sole cost and expense. Tenant shall indemnify, defend, and hold harmless Landlord from and against any loss, cost, damage or liability (including reasonable attorneys’ fees) incurred by Landlord in connection with such cooperation. 2.3 Fixed Term. The initial term of this Agreement (the "Fixed Term") shall commence on the Commencement Date and shall expire on _______, 20__. 2.4 Extended Terms. Provided that no Event of Default shall have occurred and be continuing, Tenant shall have the right to extend the Term for two (2) consecutive renewal terms of fifteen (15) years each (each, an " Extended Term ," and collectively, the " Extended Terms ") with respect to all, but not less than all of the Properties. Each Extended Term shall commence on the day succeeding the expiration of the Fixed Term or the preceding Extended Term, as the case may be. All of the terms, covenants and provisions of this Agreement shall apply to each such Extended Term, except that (x) the Minimum Rent payable during such Extended Term shall be the greater of the Prior Rent and the Fair Market Value Rent for the Leased Property (such Fair Market Value Rent to be determined by agreement of the parties or, absent agreement, by an appraiser designated by Landlord) (taking into account that the Base Year shall remain unchanged) and (y) Tenant shall have no right to extend the Term beyond the expiration of the Extended Terms. For purposes of this Section 2.4 , " Prior Rent " shall mean an amount equal to the per annum Minimum Rent in effect on the last day of the Fixed Term or Extended Term immediately preceding such Extended Term. If Tenant shall elect to exercise either of the aforesaid options, it shall do so by giving Landlord Notice thereof not later than one (1) year prior to the scheduled expiration of the then current Term of this Agreement (Fixed or Extended, as the case may be), it being understood and agreed that time shall be of the essence with respect to the giving of such Notice. Tenant may not exercise its option for more than one such Extended Term at a time. If Tenant shall fail to give any such Notice timely, this Agreement shall automatically terminate at the end of the Term then in effect and Tenant shall have no further option to extend the Term of this Agreement. If Tenant shall give such Notice, the extension of this Agreement shall be automatically effected without the execution of any additional documents; it being understood and agreed, however, that Tenant and Landlord shall execute such documents and agreements as either party shall reasonably require to evidence the same.